Freon, a registered trademark of the DuPont corporation, is a chloro-flouro-carbon (CFC) that runs through some air conditioning units. Freon absorbs heat, preparing the cool air for distribution throughout air conditioning ductwork. Freon used to be a common component of air conditioners and refrigerators; however, discovery of its detrimental effects led DuPont and other manufacturers to develop safer, more effective refrigerant compounds. If your air conditioner leaks Freon, become aware of the hazards and take precautionary measures. 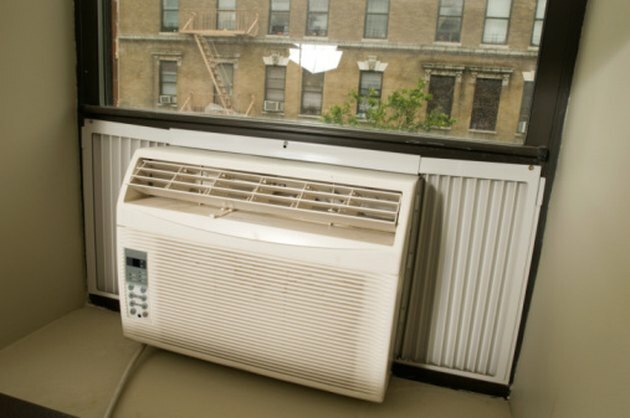 Even window air conditioners contain potentially hazardous refrigerants. Exposure to high levels of CFCs poses significant health risks. Skin contact with CFCs results in dryness, irritation and cracking. The most severe health dangers associated with CFC exposure result from prolonged inhalation of vapors. Short periods of CFC inhalation can cause dizziness, loss of coordination and increased heart rate. Long periods of inhalation or inhalation of high concentrations can cause coughing, shortness of breath, unconsciousness and death. Because of their heat absorption qualities, CFCs cause frostbite upon ingestion or contact with eyelids. Although the health risks associated with CFC exposure should not be underestimated, home air conditioners rarely leak fatal quantities or concentrations of CFS. According to the Environmental Protection Agency (EPA), soils do not absorb or bind well with CFCs. As a result, CFCs tend to easily penetrate soils and seep into sources of ground water. The presence of CFCs in ground water sources can harm plants and animals and contaminate well water. CFCs, such as Freon, can drift from the earth's surface to the upper atmosphere, says the EPA. In the upper atmosphere, CFCs become a source of chlorine atoms and contribute to the depletion of the earth's ozone layer. Depletion of the earth's ozone allows increased ultraviolet (UV) radiation to reach the earth's surface. The environmental impact of increased UV radiation on the earth's surface is generally referred to as "global warming." Researches speculate that global warming causes detrimental effects on the earth's environment and human health. If you think that your home air conditioner is leaking Freon, contact a certified air conditioning technician for assistance. Adding more Freon without repairing the leak amounts to "willfully venting" refrigerants into the atmosphere. Willfully venting refrigerants is against the law and punishable by incarceration or hefty fines. If your air conditioning unit has a service agreement or warranty, contact the unit's manufacturer for assistance.